The archive of Suriname contains 42 books with the names and living situations of all the people enslaved in Suriname during the nineteenth century. Historian Coen van Galen of the Radboud University and Maurits Hassankhan (Anton de Kom University of Suriname want to give these people back their names and stories by making the registers accessible to the general public. The slave registers contain the names of roughly 80,000 people who lived in slavery in Suriname between 1830 and 1863, when slavery was abolished. Slave owners were required to register their slaves, including the date of birth, mother’s name, and any changes such as birth, death, liberation, sale, leprosy, or other information that was important for the status and value of the slaves. The slave registers are available in full at the Suriname National Archives, but the public is only allowed extremely limited access.The registers are not digitalized and also missing an index. Example of a page in the slave registers. 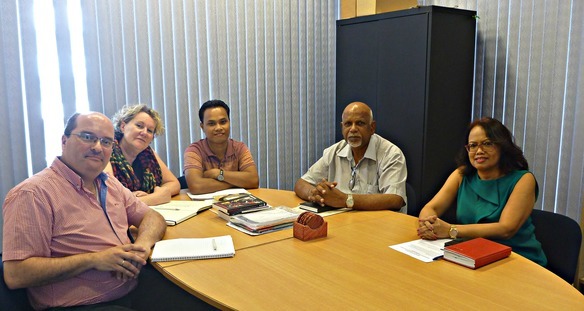 The people involved in the project: From left tot right Coen van Galen, Willeke Guelen (both Radboud University), Effendy Karto (National Archive Suriname), Maurits Hassankhan (Anton de Kom University) and Rita Tjien-Fooh (landarchivaris Suriname, NAS). Help is required in order to have the slave registers made public. To start, help in the form of money is needed—to the tune of 25,000 Euros. Coen van Galen: “In addition to this sum, we are also looking for people who want to help convert scans of the slave registers into the online database.” This database will eventually be available to the public via the website at the National Archives in The Hague. Would you like to help? Please donate via this site. Any amount is welcome. Would you also like to help convert the scans into the database? Please sign up here. Together, we can give enslaved people back their names and stories! The project ‘Help! 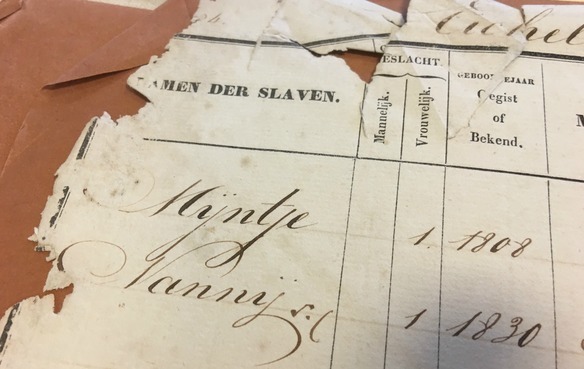 Make the Surinamese slave registers public’ is a Surinamese-Dutch collaboration between Radboud University, the National Institute for the Study of Dutch Slavery (NiNsee), Anton de Kom University of Suriname, and the National Archives of the Netherlands and Suriname. The project is also supported by Prins Bernard Cultuurfonds and CLARIAH. Would you like to know more about the slave registers, Coen van Galen, and the progress of the project? Please visit www.ru.nl/slavenregisters or follow the project on Twitter or Facebook. Would you like to help us to convert the scans? Click here register here. € 10 You will receive regular newsletters about the progress of the project. You will receive regular newsletters about the progress of the project. € 25 You will receive regular newsletters about the progress of the project. You will receive regular newsletters about the progress of the project. € 50 You will receive regular newsletters about the progress of the project and your name will be listed on the project website. You will receive regular newsletters about the progress of the project and your name will be listed on the project website. € 100 You will receive regular newsletters about the progress of the project and your name will be listed on the project website. You will also receive an invitation to a lecture by Coen van Galen. You will receive regular newsletters about the progress of the project and your name will be listed on the project website. You will also receive an invitation to a lecture by Coen van Galen. € 250 You will receive regular newsletters about the progress of the project and your name will be listed on the project website. You will also be invited to a special tour of the National Archives. You will receive regular newsletters about the progress of the project and your name will be listed on the project website. You will also be invited to a special tour of the National Archives. € 500 You will receive regular newsletters about the progress of the project and your name will be listed on the project website. You will be invited to a special tour of the National Archives and to the official launch of the digital books. You will receive regular newsletters about the progress of the project and your name will be listed on the project website. You will be invited to a special tour of the National Archives and to the official launch of the digital books. € 1.000 You will receive regular newsletters about the progress of the project and your name will be listed on the project website. You will be invited to a special tour of the National Archives and to the official launch of the digital books. Coen will also l... You will receive regular newsletters about the progress of the project and your name will be listed on the project website. You will be invited to a special tour of the National Archives and to the official launch of the digital books. Coen will also look up your personal family history in the slave registers.